Adam Ondra has been slowly ramping up his efforts down in the Red River Gorge with a few onsights of “easier” routes like Omaha Beach (5.14a) and Transworld Depravity (5.14a), but today he turned his sights to something a little bit harder: Adam Taylor’s heretofore unrepeated route Southern Smoke Direct (proposed 5.15a). Southern Smoke Direct is, as it sounds, the most direct line up a section of wall at Bob Marley that tackles a difficult boulder problem right off the ground before heading into Southern Smoke (5.14c), a line that is more a matter of resistance climbing than anything else. I was in Kentucky myself this past weekend and one of the topics of conversation when I wasn’t busy repeatedly failing on everyone’s warmup at the Motherlode was what Adam Ondra would try when visiting the Red, and trying to flash Southern Smoke Direct was something we all agreed actually seemed quite possible. Provided he could get some good beta for the boulder problem and it wasn’t absurdly difficult, it seemed likely that he could finish the route if he could pull off the boulder problem. If ever a hard 5.14/easy 5.15 were flashable, this route was a perfect candidate. And if the boulder problem didn’t work out for the direct, he could always still try flashing Southern Smoke. As it turns out, this latter scenario didn’t come into play. He flashed the whole rig. Southern Smoke Direct. Hard to believe it, but it is true! two dazs ago felt bad, didn’t know what to climb as I wanted to save onsights/flashes for another year, and now this came! thanks everyone for the beta and good vibes, moment I will never forget. Everything went so perfect. 9a benchmark I’d say. Other notable scorecard updates include onsights of The Nothing (5.14a) and Omaha Beach (suggests 5.13d), repeats of Fifty Words For Pump (suggest 5.14b) and Lucifer (5.14c), and the FA of an old project at the Motherlode left of Take That, Katie Brown that is likely 5.14c. Life’s great. Sometimes you are unlucky, some days you seem to get luck from nowhere. Today it was definitely like this. Thanks everyone for the good vibes and beta, it was a very memorable experience! He climbed with confidence and did not hesitate on any moves. This was the most inspirational moment that I have witnessed in climbing. Jens will completely focus on the grade/downgrade, then claim that “grades are not important”. I think the difficulty of the line may have had something to do with it . 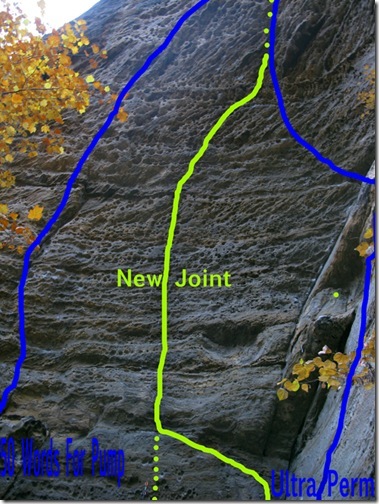 . .
Also (just to speculate) I suspect Woods and Cardwell gave him good beta on the start boulder problem, but he probably figured out most/all of the upper section Southern Smoke on his own. The start is certainly where a huge difference is likely to be found; imagine not having any of the easier new beta they found (~V11) and having to climb it in the same way as Adam Taylor (~V13). That would make a huge difference in terms of onsightability. I don’t think this could have gone any better for Ondra. I was anticipating him flashing Pure Imagination (or focusing his flash effort here) and subsequently downgrading, thus circumventing the infamous 9a flash. But a flash of SS direct, both provides him with this impressive accomplishment, maintains his humble status (which is awesome), and provided us, in the peanut gallery, with a surprise! Awesome work! Hopefully there’s a hard project or two around for Adam to try, ’cause the dude is going to climb all the established hard routes within the next couple days. Adam Taylor has a very hard looking project between Bronaugh and Purgatory but I’m not sure that’s an open project at this point. Checking this list of 5.14s in the Red, it looks like there are still only 8 open 5.14s left for him to even try (he’s already done 8). Is the “Vader Project” an open one, or is that considered Jonathan Siegrist’s deal? I know he put a lot of time into it last year, but it was originally bolted by a local guy, and Dave Graham (and I presume others have also worked on it). Sounds like it’s in the 5.14d range from Siegrist’s last blog posts about it. Adam Taylor did it a few months ago calling it The Death Star. Not as hard or as cool as it first appeared apparently. Wow thanks, didn’t even hear about that. isnt there an open project right of kaleidoscope at drive by? Or did that go already at like -14? What about the ‘Sharma Project’? Do you know anything about that one, Narc? I have no direct knowledge from anyone who has tried it (assuming that anyone even has), but looking at it from the ground has always left the impression that it looks impossible. Ondra did the two routes right next to it so I’m sure he’s at least had a look at it. I’ve heard over the past couple of years that all the moves have gone in the roof (either by Adam or Sharma), that there is no known direct start, and that linking all the moves was said by Sharma to be too hard. Just what I’ve heard…. As far as I recall, the bottom of that project still needs to be bolted. Also, there is an extension to Thug Life that Enzo bolted, supposedly in the 5.15 range but very speculative it would seem. I’m interested to see if Adam bolts anything new in the gorge. Based on Ondra’s scorecard comments about Thug Life (which he onsighted) being chipped it seems unlikely he would devote much effort to the extension. Why bother with chipped routes in Kentucky when there is so much natural rock to climb on? Yeah chipping at the RRG is WEAK. I mean, the rock is so beautifully featured and there are so many potential holds, why would someone ever want to chip more of them? I’d heard rumors that Thug Life was chipped, it’s disappointing to hear it confirmed. Adam says he used the Cedric Lachat beta which are the same as Taylor did. What you say is not true. Adam used the original 8b boulder start. Cedric Lachat’s beta was described as “almost” identical to Taylor’s, not exactly the same. Who knows how the little differences may have affected the difficulty? Adam also called the boulder problem V12, not V13. Either way, this one seems to be a bit easier than previously thought. It’s funny how different things can feel when you know they are possible. Big props to Adam Taylor for being the first to see the light and break through. One man’s V12 can easily be anothers V13. Ashima and Ondra should go to Clark together and knock out the second and third of JL in a few days. Something makes me think JL will not fall that easily. I suspect Ondra could get Jumbo Love with about a week or work, give or take, if conditions were good. That’s assuming it’s really 9b and not 9b+ as has been speculated by Ethan Pringle and others. Ashima I doubt can climb it, at least not right now. Besides the fact that it’s at least 2 grades harder than her best redpoint, aren’t a lot of the cruxes lurpy dyno moves, aka the Sharma specialty? Unless there’s some tiny intermediate holds she could use (which is possible) I suspect that would prove to be a significant obstacle. And then there’s the issue of rope drag and rope weight with that monster-mega-pitch… Strength to weight ratio is a big deal, and that much rope would be a larger fraction of her weight than someone like sharma, and might be more of a hinderance for her than a heavier climber. for most routes i don’t thik it would be a big deal, but JL is 2-3 times longer than most pitches. She would certainly have to figure out her own method, but great climbers tend to be able to apply their own style to many different types of climb. Sharma found powerful, sharma-esque sequences because that’s what works best for him, not necessarily because it was the only option. That wall does look pretty blank though . . . It makes a lot of sense that Ondra has and will continue to set the bar in the red considering the style of climbing to be so much more resistance oriented than other crags, which appears to be a specialty for him compared with more crux oriented routes. I know JL is the greatest thing since sliced bread and all, but isn’t this a lot of pressure? I mean, Sharma seemed close to cracking sometimes with the pressure to perform on the thing. I know we’re talking about the hardest established route on the continent, and the best climber in the world, but the kid is also on vacation to the US for the first time ever. I wouldn’t be suprised if he bounced around a bit just sampling what the US has in terms of variety. You know, go see Hueco, Rumney, Rifle, Yosemite, Boulder, etc etc. Climb the different types of stone, see the different scenes. I know I don’t get to travel much, so when I do, I try to spend time ticking off the classic, iconic problems (which is why I feel the need to flail on Bumboy everytime I make it to HP40). Spending weeks of a limited vacation beating yourself to death on something very hard, especially if its your first trip there, seems like a waste. Jumbo Love isn’t exactly the only route at Clark Mountain though, there are a bunch of apparently hard and good 5.14 routes from Randy Leavitt, Chris Lindner, Ethan Pringle, and others. Plus if he just wants to climb and not have a huge crowd watching him it would definitely be one of the places to do that. Can you imagine what a circus Waimea Wall at Rumney would be if word got out Ondra was going to show up there? No one has mentioned the obvious yet. If Southern Smoke Direct is now confirmed 9a (Daniel Woods and Cedric Lachat have sent and said 9a), then how can Southern Smoke be 8c+… it can’t. I think realistically it probably never was 5.14c. There have been a lot of underhanded comments from people who have done it that it’s soft. aaaaand the US’s sport climbing community’s collective impression of “Hard” has disintegrated.